Eucharist Bread …was offered by Algoods for the Divine Liturgy today. David and Lou Turner and David’s mother, Mary Jean, on the death of David’s father, Harry Turner during Holy Week. Steve, Sheryl, Wendy and Stephen Chamblee on the death of Steve’s father, General Mac Chamblee, on Pascha morning. Many thanks go to all those who worked so hard to make our Agape Vespers Feast a success!! Special thanks go to Christina for heading this up and to Costas and his helpers for the wonderful food! Wednesday, May 4th is the last day for Early Bird registrations for the upcoming Parish Life Conference to be held in Memphis June 16-19. Because our clergy will be attending the Conference there will be no Daily Vespers on Wednesday June 15th. There will also be no catechism class on Wednesday June 15th or Saturday June 18th. Nor will there be Daily Orthros on Thursday or Friday of that week. However, Father James will be returning on Saturday afternoon. So our regular services will be celebrated on Saturday and Sunday June 18th and 19th. * The Men of the parish meet for lunch and fellowship on the first Thursday of the month. This month they will meet at Rooster’s in the Fondren area. * Memphis on June 16-19. More information (hotels, etc.) is available through the Archdiocese website at antiochian.org. * His Grace, Bishop ANTOUN will be here the weekend of May 6, 2012 to help us celebrate our 25th anniversary as a parish. The planning committee is working very hard to make our celebration a memorable one. There will be an evening event at the MS Museum of Art on Friday, May 5th. Other events are being planned and more information will be available in the coming months. Remember Early Bird Registration ends May 4th. This entry was posted in Announcements on April 29, 2011 by danrooti7. We welcome Amy and Michael into the flock of St. Peter’s today! God grant you both many years. This entry was posted in Announcements on April 23, 2011 by danrooti7. “Unique and holy day, King and lord of days, feast of feasts, solemnity of solemnities. . . “ Thus we celebrate the Great Feast because of the resurrection of our Lord and begin the season of celebration which lasts through Pentecost. The paschal solemnities (of Maundy Thursday and Good Friday) are joined to the feast of the resurrection to endow the mystery of Christmas and the Incarnation with the fulness of its meaning and are the prerequisite condition for Pentecost. Easter, therefore, is the center, the heart of the Christian Year. Eucharist Bread …was offered by the Dn. Richard Roots for the Vesperal Liturgy of Great and Holy Thursday, by the Hendersons for the Vesperal Liturgy of Great and Holy Saturday and by the Morrises for the Divine Liturgy today. Please remember the following in your prayers: Fr. Leo, Kh. Be’Be’, Stephen and Amy, Justyn and Jeffrey; Amy and Brantley Oliver; Aidan Milnor, the Milnor family; Sam and Lamia Dabit; David Turner’s parents, Harry and Mary Jean; Fr. Joseph Bittle, Kh. Joanna, their daughter Abigail and the rest of their family. Welcome and Many Years!! to Michael and Amy Surratt who were chrismated this morning. During Great Lent the traditional fasting discipline (no meat, poultry, fish, eggs, dairy, wine and oil) is observed on all days of the week until Pascha (except Palm Sunday on April 17th, when fish, wine and oil are permitted). There is no fasting during the week following Pascha ( Bright Week). This entry was posted in Announcements on April 20, 2011 by danrooti7. Eucharist Bread …was offered by the Bakers yesterday for the Divine Liturgy for Lazarus Saturday and by the Woods for the Divine Liturgy today. 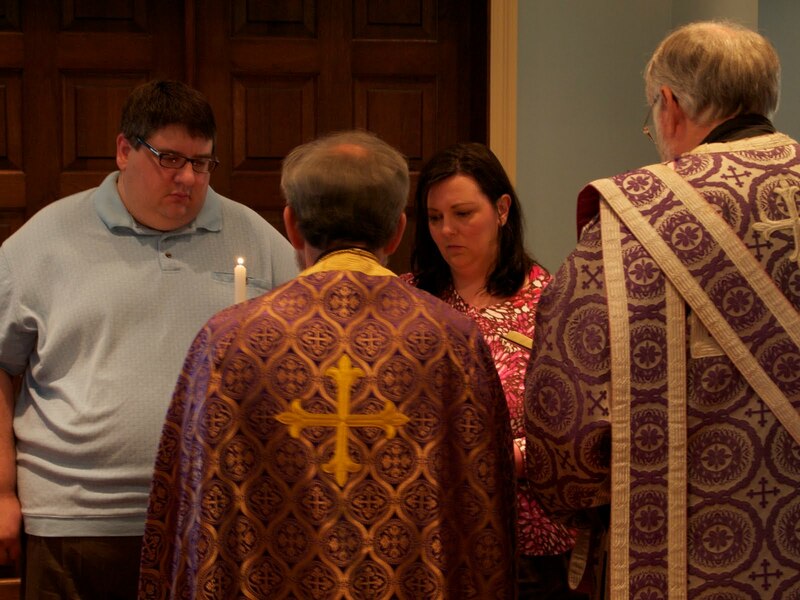 Michael and Amy Surratt will be chrismated prior to the Vesperal Liturgy on Great and Holy Saturday morning at 9:00 a.m. Please keep them in your prayers. · The Feast of Pascha is April 24th and St. Peter’s will be hosting Agape Vespers (beginning at 3:00 p.m.) and the meal afterwards. Sign-up sheets are available in the fellowship hall for both. Sunday, April 17 — Bridegroom Matins, 6:30 p.m.
Monday, April 18 — Bridegroom Matins, 6:30 p.m.
Tuesday, April 19 — Bridegroom Matins, 6:30 p.m.
Wednesday, April 20 — Holy Unction Service, 6:30 p.m.
Thursday, April 21 — Vesperal Liturgy of St. Basil, 6:00 a.m.
Friday, April 23 — Royal Hours, 6:00 a.m.
Sunday, April 24 — Agape Vespers (at St. Peter), 3:00 p.m.
* The 2011 Parish Life Conference is being hosted by St. John Orthodox Church in Memphis on June 16-19. More information (hotels, etc.) is available through the Archdiocese website at antiochian.org. This entry was posted in Announcements on April 16, 2011 by danrooti7. Belated Congratulations to Chris and Rebecca Dansereau on the birth of Sophie Elizabeth (8 lbs. 3oz. 20¾ inches) on March 29th. Mother and daughter continue to do well at home. · We will hold our annual catfish dinner on Palm Sunday, April 17th, following the liturgy. Meals will be all-you-can-eat catfish, hushpuppies, cole slaw and French fries. Cost for the meal will be $9 for adults and children 12 and over, and $6 for children 5-11. We will need to turn in a headcount this week, so please be sure to place your names on the sign-up sheet. Friday, April 15 — Small Compline with Canon of St. Lazarus, 6:30 p.m.
Saturday, April 16 — Orthros/Divine Liturgy, 9:00 a.m.
— Reading of the Twelve Gospels, 6:30 p.m. This entry was posted in Announcements on April 9, 2011 by danrooti7.